Have you ever been in a situation where you missed your way to a certain place and kicked yourself for not leaving home early enough or listening to that small voice in your head that told you to take a different route? You miss your way, you’re angry, you are despondent and if you are anything like me, probably on the verge of breaking down in tears but somewhere along that ‘wrong’ route you came face to face with a miracle? Or do you sometimes find yourself at crossroads, being edged towards that route you think might spell disaster but when you finally get on it, it is blessings and favour all the way? “The steps of a righteous person are ordered by the Lord and He delights in his ways” (Psalm 37:23). That is one statement that has held through for me since I came to know Jesus and I am sure you can relate to it too. God is a father, he’s a mother, a defender of the defenseless, a helping hand to those that are struggling, he gives a comforting hug when life kicks us down and above all, he shines his light when we are in darkness! 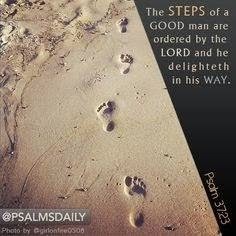 He orders our steps even when we don’t ask him to. Why? Because he loves us that much! “If God still orders my steps in spite of my unworthy behavior, how much more when I strive for righteousness in all my endeavours?” His word says He orders the step of the righteous; many of us are living in grace, his grace abounds even in our unrighteousness but that does not mean we should not strive to be righteous. I read the testimony of a woman who came to know God recently. She wrote about how God changed her life and how it seemed that even when she did not know him, he was ordering her steps so she may come to know him. Many of us who believe we are righteous think God scorns and rejects those who live in sin, or who do not know him. After reading that testimony, I came to the conclusion that God is always at work, even in the lives of those that are yet to know him. His desire is that we may all come to know him and trust in Him. Let us help each other up the path of righteousness; it is not an easy road to travel but I have to tell you, it is the most rewarding! Imagine how much closer you’d be to God and how clearly you’ll be able to hear him when he says “Take this route” or “don’t say that”. Imagine how much better life would be if you could relate better with God. Strive for righteousness. God is right beside you to help you all the way!